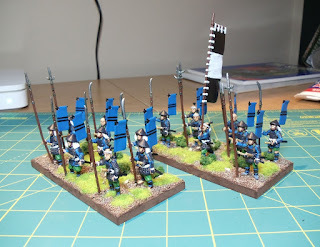 Tonight I finally finished a couple bases of Ashigaru. These minis are from Kingston Miniatures. They're pretty nice figs, nicely detailed. The basing actually turned out pretty good compared to my usual crappy basing. I've got another base of Ashigaru almost completed and I've started on a base of sohei. 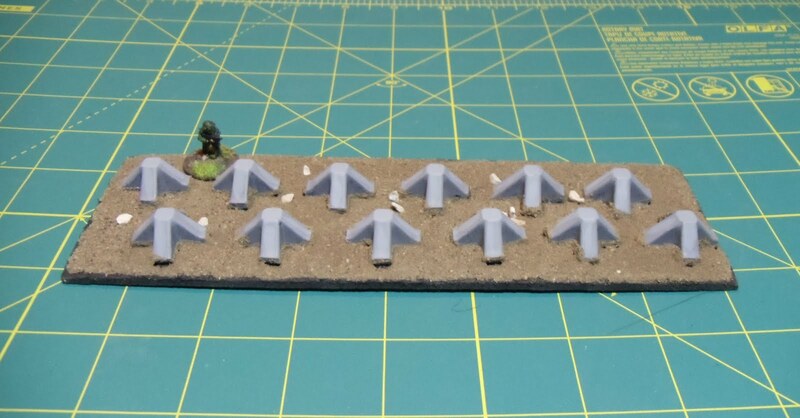 Yesterday I finished up seven bases of dragon's teeth for 15mm. The teeth themselves are some sort of concrete supply bits I acquired from my friend Chris. I have enough left over to do at least another 20 bases. 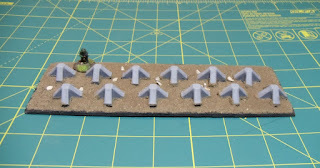 I hopefully will get my first two bases of Ashigaru based up tonight, but we'll see. I've got another base a little over half done and I've started on a base of sohei (warrior monks). Been a while since I posted so I figured I'd post up what I'm doing. Due to work being extremely busy, I haven't had quite as much time to paint. 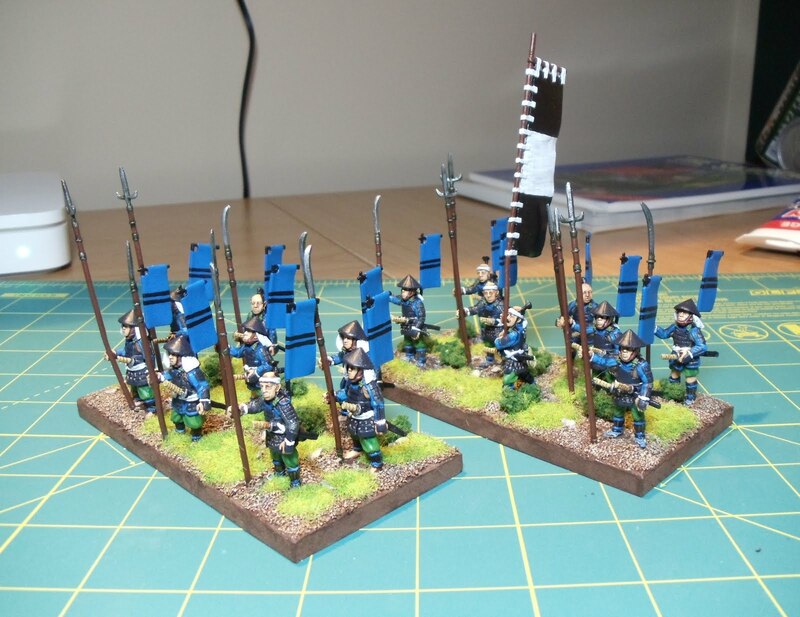 Regardless, I've got 2 bases of Ashigaru with yari sort of finished. As you can see from the pic below the figs are completed, they just need to be based. The only thing stopping me is I'm waiting for some material to come so I can do up a banner. These figs are all from Kingston Miniatures. The clan I've chosen is the Kuroda clan. See the Samurai Heraldry Gallery, page 3 about a third of the way down. 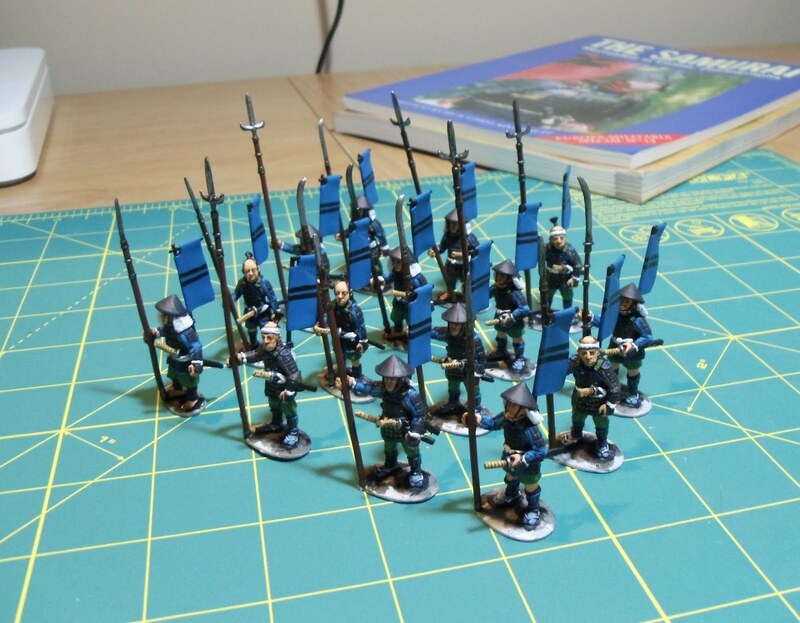 I went with this clan because they were active in the Sengoku period and they did participate in the invasion of Korea, hence keeping my opposing model options open. The other reason is I needed a sashimono design I could paint without it looking too crappy. The sashimono design of Kuroda Josui Yoshitaka fit that bill quite nicely. Once I have the bannerman and bases done, I'll post up another pic. Meanwhile I've started working on another base of Ashigaru with yari and some dragon's teeth terrain for my 15mm sci-fi stuff. Speaking of which, Chris and I are going to give Tomorrow's War a run through maybe this weekend.